Venice is a unique and precious repository of art. Artists of the highest calibre have left their mark all over the city and works by Venice’s grand masters Titian, Tintoretto, Canaletto and Tiepolo can still be viewed in situ today. Venice also has a contemporary art scene that lives up to its glorious art history. The Peggy Guggenheim Collection of 20th-century masters has long been the city’s third most visited attraction, while the Punta della Dogana, which opened in 2009, brought works by contemporary giants including Dan Flavin and Jeff Koons to the city. 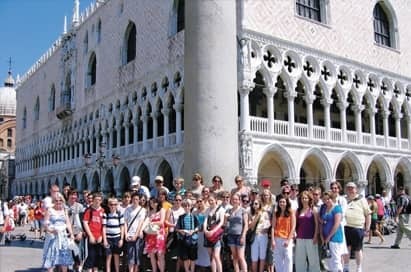 Add to this the tradition and spectacle of the Venice Carnival masks and Murano glass and there is much to inspire your art and design students on a tour to this remarkable city. The Peggy Guggenheim Collection is the most important museum in Italy for European and American art of the first half of the 20th century. It contains works from the most famous European and American modern artists including Pablo Picasso, Salvador Dali, Jackson Pollock, and Alexander Calder, and her husband’s artwork, Max Ernst. 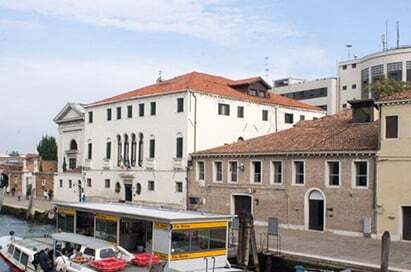 It is located in Peggy Guggenheim's former home, Palazzo Venier dei Leoni, on the Grand Canal in Venice. The Ca' d'Oro is one of the most famous civilian buildings of Venice. It was built for the Procuratore Marino Contarini, with gothic forms, between 1422 and 1440, by Lombard hands, headed by Matteo Raverti, and by Venetian stone-cutters, directed by Giovanni and Bartolomeo Bon. The last owner of the palace was, after different vicissitudes, the musician and collector Giorgio Franchetti, who financed its restoration (1916) and finally gave it to the State, together with its rich collection, that still is the core of the museum. The museum has been modernly reorganised between 1980 and 1984, and houses a wonderful art collection, composed by paintings of Venetian, Tuscan and Flemish school, splendid bronzes, renaissance sculptures and an interesting ceramic collection. The 14th-century Palazzo Rodotà houses a collection of laces from the late 19th century to the early 20th century, realized on the island, whose tradition in lace making dates back to the 15th century. Masks have been hand crafted in Venice by artisans for 800 years. Visit one of the oldest workshops in the city where masks are still made according to Venice’s authentic craftsmanship tradition. Here you will see how masks are created in their free, innovative interpretation of the world-renowned skills that ‘mascareri’ have passed on generation after generation. The working environment of Mariano Fortuny is represented through precious wall-hangings, paintings, and his famous lamps. Fortuny mingled art deco and art nouveau which is wondrously apparent throughout. Visitors will enjoy gorgeous ornaments, objects, fabrics, furniture and clothing, all Fortuny originals.